Quality Knitwear: Jumpers, Tank tops & Cardigans Are Back in Style! We have a wide range of quality knitwear designs that we can further customise for you as part of your staff uniform or workwear range. Wherever you are based in Cumbria, the North West or the Borders, you will find many styles and colours of jumper, cardigan and sleeveless jumper in stock. You can use our expertise in embroidery to ensure that you get the ideal knitted garment, embroidered correctly for your needs. The full range of wool, cotton and man made fibre knitted clothing can be seen in our web brochure. For an instant quote or to talk further about our services, please call us or use the contact form via the website. Ladies cardigan: stylish & professional black! Knitted cardigans are named after the 7th Earl of Cardigan, James Brudenell, who wore fur trimmed woollen jackets to keep warm during the Crimean War. After gaining fame for his leadership of the “Charge of the Light Brigade” these humble open fronted woollen vests became something of a fashion staple. The original cardigans were quite different to the stylish knitwear garments we know today. Quite an evolution from the original woollen vests which were worn in the British Isles and France from the 17th century. Knitwear has always been popular in Ireland and the islands of Scotland, where Aran knitwear designs can be traced back to the 9th Century. Cardigans have traditionally been popular as workwear in Britain, with fishermen and other outdoor workers. The industrial revolution increased the number of cardigans worn at home and at work, with another boost following the famous battle in Crimea. During the 2nd World War, when wool was scarce, the cardigan adopted a shorter tighter design to conserve the precious resource, almost accidentally producing a very shapely garment for the ladies! Marilyn Monroe famously posed in a cardigan in her last photo-shoot, and today it is a very versatile item of quality knitwear fashion, popping up in a surprising variety of work and leisure settings. Stitch & Print can supply you with some of the best brands from quality knitwear manufacturers with the pedigree of; Balmoral, Henbury, RTY, Kustom Kit, Premier & Russell Collection knitted garments. We always aim to make sure you can buy the smartest knitwear online or in our Wigton shop from the best knitwear manufacturers in the work clothing market in Europe. These knitwear brands pride themselves on innovative knitwear design and fabric development. We carry this through with our branding and finishing embroidery to complement the quality of our range of knitwear items. We stock a series of smart knitwear garments in different styles suitable for a number of purposes including workwear that would look completely at home in the offices of Vickers in Barrow, through to a school uniform Independent schools around Carlisle. For a more casual fashionable look you could opt for a V-neck pullover, which has a sophisticated blend of cotton & polyamide to create a lightweight knitted and fitted garment that keeps its shape! We know that size does matter, and we stock knitwear in men’s sizes from XXS to 4XL, and women’s sizes from 6 to 22. Military style men’s sweater in navy blue. Stitch & Print can add your company branding to the huge range of smart and durable knitted jumpers and cardigans which are particularly suited to the working environment. RTY have a selection of sweaters ideal for this purpose, including the Nato Style V-neck. 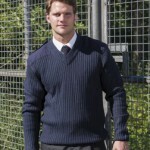 This acrylic sweater has tear and release fastened epaulettes on the shoulders, elbow patches and a pen pocket on the left sleeve. This example of outdoor knitwear is made from a blend of polyester, cotton and acrylic, and would be ideal for security applications. To look at the range & see how things will look with your logo, embroidered on your choice of quality knitwear, visit the website. This entry was posted in Knitwear and tagged cardigan, Cumbria, embroidered, jumper, knitwear, North West, tank top, workwear on 12th February 2015 by admin.